St. Joseph’s Health offers a variety of volunteer opportunities throughout the organization. We would like to offer you the opportunity to use your discretionary time for the benefit of others through service as a volunteer. Each and every charitable act of a volunteer contributes to the excellence of care delivered to our patients. With genuine concern and compassion, volunteers can provide support by transporting a patient from one area to another and assisting in the daily operation of various departments, such as: Food Services, Environmental Services, Medical Records, and more. Helping friends and families who await news of a loved one after surgery, assisting customers in our gift shop, or working “behind the scenes” in our business offices, you can be assured that your time will be well spent. Each role is essential in helping to brighten the lives of our pediatric patients. Whether volunteers are interacting with patients, siblings and families in the playroom, assisting with special events or helping to organize and maintain a safe, clean environment - they are helping to support our patients and families. Currently, St. Joseph’s Wayne Medical Center is in need of volunteers in the Gift Shop late afternoon/early evenings and on weekends. Volunteers contribute with one-to-one visits, assisting with transportation, special activities with residents, staffing the gift shop and café and more. Volunteering schedules are flexible and based upon the availability of the individual volunteer. After submitting an application, the volunteer applicant must register for and attend an information session. Click here to register. Please note, teen volunteers must be at least 16 years old and they must commit to a minimum of 60 hours before receiving a certificate. 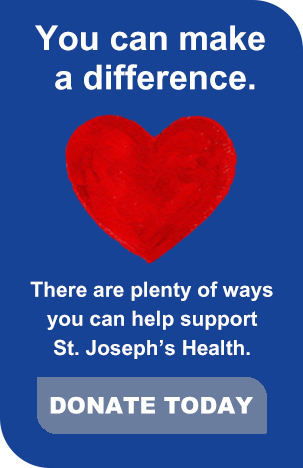 Thank you for your interest in joining St. Joseph’s Health Volunteer Services!